POET’s Founder and his family connect with others in rural Kenya farm community. A farm kid at heart, Jeff Broin, Executive Chairman and Founder of POET, doesn’t shy away from getting dirt under his fingernails. He knew it would be hard work and an unmatched learning opportunity when he and his family signed up for a mission trip to Tawa, Kenya through the World Servants mission organization, which pairs volunteers from around the world with high-need service projects. From June 20 to June 30, the Broin family laughed, danced, dug in the orange dirt of Kenya and shared in fellowship with fifteen other U.S. volunteers and several local people from the Tawa area. On the surface, their project was to help the Tawa community renovate the Kakuswi School for the Deaf. But as with all truly life-changing events, the real work and reward, says Broin, came in the development of relationships and new knowledge. In April of 2012, Broin announced a change in pace in stepping out of the role as POET’s Chief Executive Officer. While continuing to guide the company as Executive Chairman and also work on industry issues as Chairman of Growth Energy, the move was also designed to give him time for additional service efforts away from the day-to-day role of CEO. One of Broin’s goals was to further develop the company’s philanthropic arm – the POET Foundation – and start Teach A Man to Fish, a humanitarian outreach foundation he founded with his wife and children. The “catalyst” for this move, he says, was a desire to spend more time with his family, and more time with the service efforts he believes are another part of his duties. 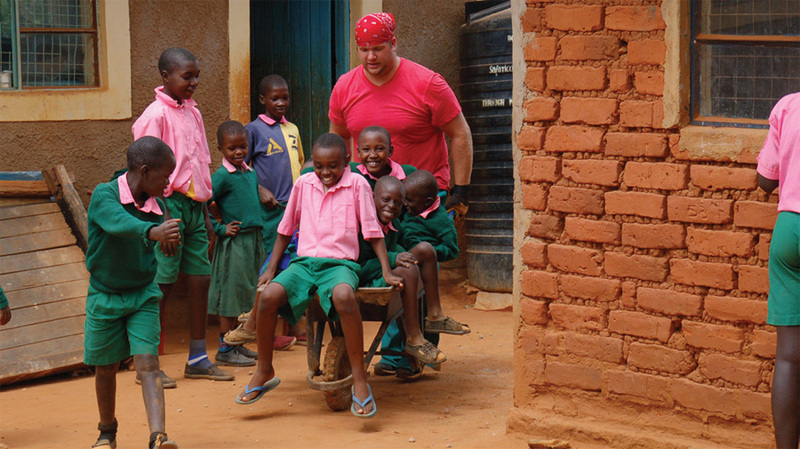 Wheelbarrow rides given by a World Servants volunteer were a welcome break while working on the school. The Tawa community’s native language is Kikumba and the school the Broins were set to work on was for the hearing impaired. Communication could have been a concern, but that concern was quickly put to rest when they arrived at the village. Jeff Broin plays games with the children on their school playground. 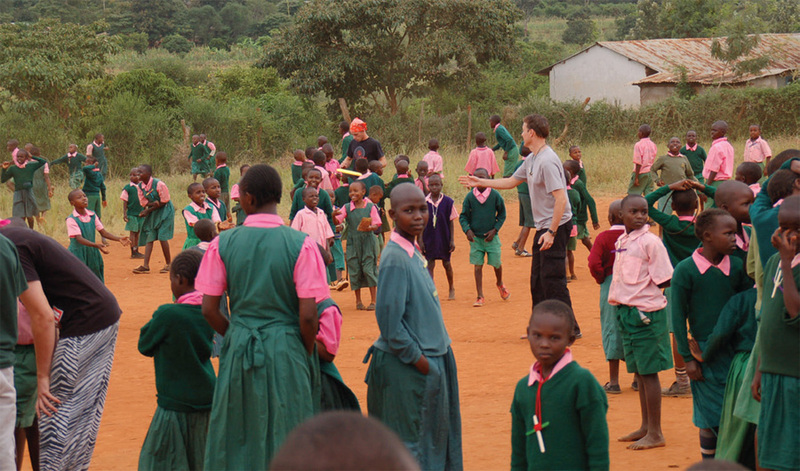 One of the ways the Kenyan children communicated with the volunteers was in the simple act of playing with each other while braiding the American girls’ hair. Although the World Servants group was able to cultivate relationships as they completed new roofing, flooring, siding, paint and fence projects for the six year old school, the group wanted to do more for the impoverished area. Located in eastern Kenya and drawing a little over 19.5 inches of moisture a year, Tawa is home to corn and edible bean farmers. 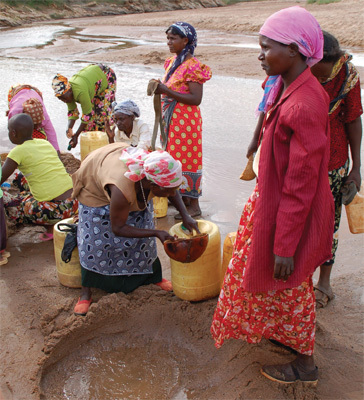 According to Ben Kikuvi, an engineer and farmer in Tawa who fed and worked with the volunteers each day, seventy-five percent of household income in the area is derived from subsistence agriculture, with seventy-four percent of the community living on less than two dollars a day. Yet despite these challenges, everyone the group encountered was happy and generous, and Broin knew that their ten days of effort weren’t enough. Having worked from home with other assistance efforts in Africa, he knew there had to be a long-term way to help the rural community, and that it lay in the earth around him. 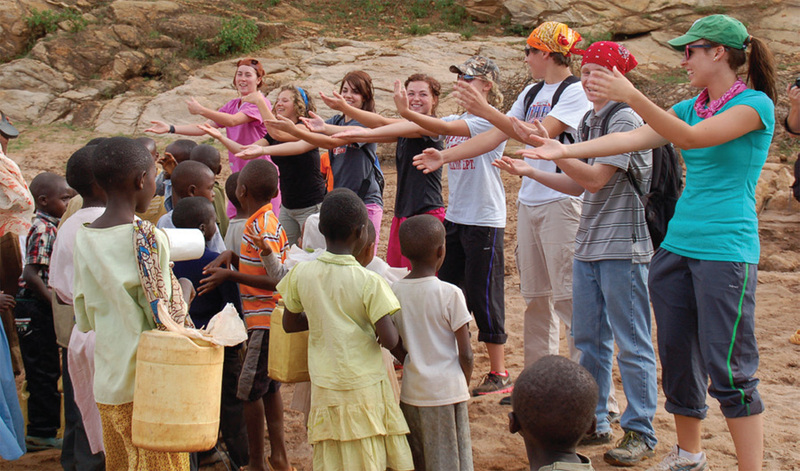 The American children teach the Macarena to kids from Tawa. The belief that a stronger agricultural economy is related to a cleaner, more sustainable and successful future is nothing new for Broin. Fueled by his observations, when Broin returned home he connected Kikuvi with a leading biotechnology company. Kikuvi will soon begin a pilot program with the company to test the viability of much improved hybrids in the semi-arid region. For Kikuvi and the rest of the Tawa community, these “timely” efforts to revitalize agriculture in the area were just another indication of the volunteers’ dedication to the cause. Today, through the POET Foundation, Broin is continuing to develop assistance projects in Kenya, Nigeria and the Central Africa Republic and his family is stepping up to the challenge as well, as they work to organize and take part in their new family outreach effort. The World Health Organization estimates that nearly 300 million people globally live with deafness or near-deafness; 80% of these people live in “lowand middle income” regions. Most of these cases of deafness could be prevented with vaccination against or treatment for common infectious diseases. Although hearing aid technology exists to assist many of these individuals, in developing countries, less than 1% of those who need this technology have access to it. The Kakuswi School opened in 2006 as a day school to serve 7 children. In 2008 it was converted to a boarding school to provide access to children who lived farther away. Today the school serves 28 children and has plans to serve many more in the future. 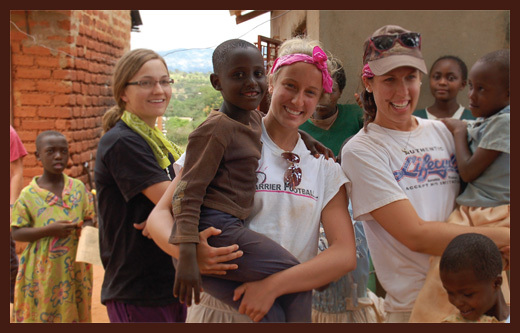 When 17-year-old Miranda Broin agreed to participate in a mission trip to Kenya, Africa, she knew she would be volunteering her time to help out the people of a town called Tawa. What she didn’t anticipate was the impact that the people there would have on her or that the love they showed would steal her heart. To hear more about Miranda’s experience, read "The Relationships We Made".